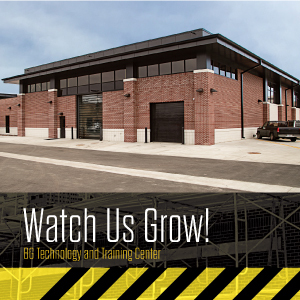 BG Technology and Training Center is now open! | BG Products, Inc.
On February 18, 2019, the Technology & Training Center officially opened and hosted its first BG University class. Read on to learn the story behind this much-needed facility. In 2016, it was determined that BG was quickly outgrowing many of the facilities in Wichita. Proving Ground, originally the “Auto Lab,” had a small 4-bay metal shed for vehicle testing. While functioning in this capacity for years, it was evident due to the demands on the space, that it was not really getting the job done. The Research & Development Lab was one of the first buildings constructed after the Wichita plant was purchased in 1986. This space was primarily a chemistry R&D facility, used as a production testing center and for field-testing oil samples. 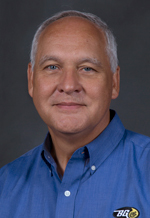 Again, this worked for BG’s initial needs, but as demand grew, it became difficult to perform the required testing on many emerging chemical technologies. In addition, there was a lack of space for the new equipment needed to accomplish so many requests. BG University had a nice big training classroom. However, it was solely designed for a classroom environment. New technologies were included in the curriculum, and the space had room for significant improvement. BGU was lacking a dedicated hands-on demo area. These training portions were held in the Auto Lab or even outside in a tent… not the best when it’s cold or in Kansas winds! In order to drive future success for BG, it was time to explore options for these three major areas. Particularly, a new facility to house these departments under one roof, because they worked so closely together already. In April 2017, the BG Board of Directors approved the building of a new Technology and Training Center in Wichita. This would require demolishing the Auto Lab and chemistry lab to make room. By July 2017, plans were in place to start the construction process. Much preliminary work was needed before demolition could begin, from replatting of the property to moving utilities and vacating easements in order to prep the land, to shifting employees and equipment to other areas of the company. In total, more than 60 people and their equipment from different departments made the temporary move for over a year. The BGU training room was repurposed into office space. Operations staff were moved from Wichita to El Dorado in order to create temporary office space for the Proving Ground and Technology staff. Wichita warehouse space was converted into a temporary Auto Lab and demo area, and several offices and meeting rooms became temporary lab space. This complicated shuffle was completed by Fall of 2017. BGU was faced with the biggest challenge as they had to give up their training classroom, yet training had to continue. BG is a resourceful bunch, and many different facilities located near our Wichita campus were used for classes. BGU students were troopers during this period to put up with the inconvenience. The best part is that BGU continued to train many more BG boots on the ground. BG broke ground on January 20, 2018, and the race was on to get this project completed by March 2019. The new facility has a modern design with future growth plans taken into consideration. The new chemistry lab is almost the size of the entire building it previously occupied. 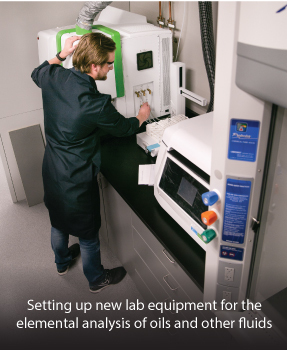 It will have many new pieces of equipment to ensure more complex testing in less time. In addition, the lab will be obtaining ISO 17025 certification, which shows that BG’s lab meets the highest standards of any lab around the world. The new Proving Ground has enough space to handle more vehicles with improved testing efficiency. With a new engine dyno and state-of-the-art equipment, the Proving Ground will be able to tear down and get a full analysis of how BG products perform and obtain improved test results to ASTM standards. A new motorcycle and UTV dyno, as well as an all-wheel dyno, will help give BG the broadest testing capabilities necessary for today’s technologies. BGU’s new training classrooms provide the flexibility and technology needed for a top-tier learning environment. The demo training room will take hands-on learning to new heights, in order for our field to best demonstrate how BG products perform. 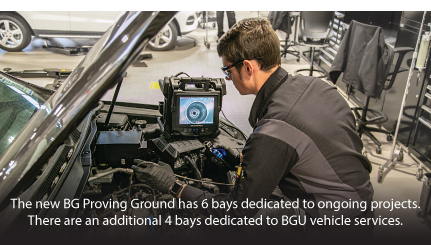 There is also a separate and dedicated vehicle service area, with four bays, so students can learn how BG services are performed directly on the vehicle. What a great accomplishment from our architect, SCJF, contractor, Dondlinger Construction, and of course the staff of BG and the support of the BG Board of Directors, to make this come true. There is still much to do and learn as the long-awaited move-in continues, and we see the new innovations which this facility has to offer.